My name is Captain Michael Mann. I am USCG licensed and insured charter captain with over fifteen years of “fishing for a living” experience. As a child, I fished the lakes and rivers of Georgia, Tennessee and Alabama with my grandfather who taught me the need to conserve our natural resources as well as how to understand the seasonal movement of game fish. I now run my guiding business out of New Smyrna Beach. Just 20 minutes south of Daytona Beach and 45 minutes from Orlando, New Smyrna Beach is the redfish capital of the world, and home to the Cape Canaveral National Seashore and Mosquito Lagoon. 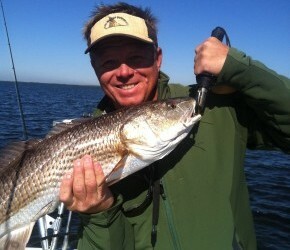 It’s the perfect place for inshore/flats fishing and a great place to start an offshore fishing trip. There is nothing like it in the world. Yamaha powered Hell’s Bay boat.